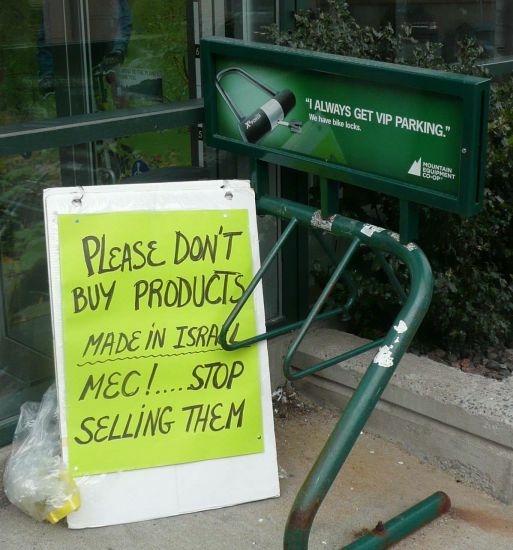 MEC has become a target of the boycott because " they are selling products that were originally designed for the Israel Defence Forces," says Jackie Barkley. David Parker and Jackie Barkley handing out pamphlets outside the outdoor equipment store in downtown Halifax. Jackie Barkley is asking Mountain Equipment Co-op (MEC) shoppers not to buy water bottles made in Israel for their next camping trip. 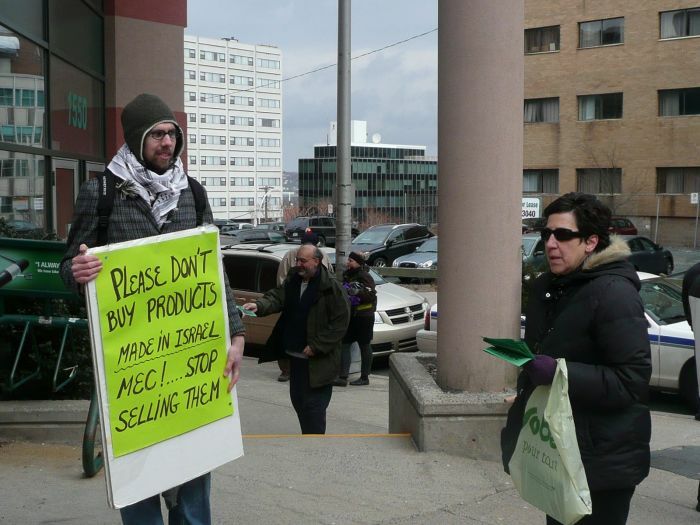 Barkley, a member of Canadians, Arabs and Jews for a Just Peace, was handing out pamphlets outside the outdoor equipment store in Halifax on Friday, encouraging MEC members to join the Boycott, Divestment and Sanctions (BDS) movement, and not buy products made in Israel. "BDS is designed to try to find a non-violent route to oppose Israeli government policy," says Barkley, "not unlike the important boycotts against South African products, which was a really important part of bringing down Apartheid in South Africa." The BDS campaign demands that Israel recognize the Palestinian people's right to self-determination and fully comply with international law. Bill Chernin of the Atlantic Jewish Council was also handing out pamphlets at MEC. He opposes the BDS campaign and says its intention is to single out, isolate and delegitimize Israel. "He's right," says Barkley. "It is a political and economic critique of Israel and its policies…and its treatment of Palestinian people." Barkley emphasizes that the intention is not to "drive Israel into the sea...but to delegitimize the current political positions of the Israeli government towards occupation, towards the siege of Gaza and towards the rights of the Palestinian people." MEC has become a target of the boycott because "they are selling products that were originally designed for the Israel Defence Forces" and also because MEC is a co-op that prides itself on progressive policies, says Barkley. MEC's co-op status means that people who shop at MEC have some power in shaping the organization's purchasing policies, she says. This is not the first time that MEC members have raised the issue of the co-op buying goods from Israel. "This issue came to light early in 2009," says Tim Southam, Public Affairs Manager at MEC. "It actually resulted in a resolution going before our membership." "The resolution was calling on MEC to stop sourcing products from Israel," says Southam. "The membership rejected the resolution." Southam says the products MEC purchases from Israel meet the co-op's ethical standards. "We don't divide our purchasing along political lines," says Southam. "We don't divide our membership along political lines." "MEC says they don't take sides in the conflict, but profiting from war and occupation is taking sides," says David Parker, a member of the Halifax Israeli Apartheid Week organizing committee, which organized the MEC boycott action. "The boycott is about making an economic impact, but also changing public opinion," says Parker. He is hopeful that by talking to people and raising awareness about the situation in Palestine, MEC's membership will realize the importance of BDS and take action. Parker says one of the things MEC members can do is to vote for a Board of Directors candidate who supports a boycott of Israeli companies. MEC members can vote for board candidates this month. "Having a critical voice on the Board of Directors would be a good step forward," he says. Submitted by Anonymous in Halifax (not verified) on Sun, 03/20/2011 - 11:20. Submitted by Holden (not verified) on Mon, 03/21/2011 - 22:14. BDS is nothing less than a disgusting combination of Arab and Communist terrorism and anti-semitism, acted out by brainwashed idiots in an attempt to weaken and destroy the state of Israel. It's generally a a pile of stinking lies masquerading as a human rights concern. Fortunately, these idiots don't often succeed. Mountain Equipment Coop has been aparticular target in several ways. BDS activists have so far unsuccessfully tried to sleaze their own candidates onto the MEC Coop board in Vancouver. No doubt they are trying something similar in Halifax. Last time they tried it in Vancouver it was roundly rejected and all they managed to do was antagonize the management and membership of MEC. Submitted by Ariely (not verified) on Tue, 03/22/2011 - 00:23. Palestinian authority teaching curriculum and TV programs preach for hate and killing.Funded by EU and USA. SPAIN,PORTUGAL,SICILIA,GREACE,BULGARIA,ROMANIA,SERBIA,CROATIA,SLOVENIA,HUNGARY,AUSTRIA UP VIENA,FRANCE UP PARIS,ISRAEL,INDIA,RUSSIA UP MOSKOW. Watch BBC program Third eye Egypt. slaughtered a family of 5–father,mother and 3 children–the youngest 4 month old while slipping in their house. Send from Gazaz Rocket targeting a hospital while people from Gaza recived medical treatment. *Joining forces with the ones that stand against everything they pretend to demand? Act helping oppressed people to get the rights you claim to stand for!